A recent report published by Infinium Global Research on battery energy storage system provides in-depth analysis of segments and sub-segments in global as well as regional battery energy storage system. The study also highlights the impact of drivers, restraints and macro indicators on the global and regional battery energy storage system over the short term as well as long term. The report is a comprehensive presentation of trends, forecast and dollar values of global battery energy storage system. According to the report the global battery energy storage system is projected to grow at a CAGR of 32.2% over the forecast period of 2018-2024. The battery storage energy system is the system that uses batteries to store the produced energy. The energy generated from the power plates is more than the requirements so the produced energy is stored in the batteries. This stored energy can be further used depending upon the necessity. Nowadays, the battery energy system has become has become an important part of the power system or power plants in order to provide reliability and improve performance. There are various types of batteries are used to store the energy by using battery energy storage system that includes lead acid batteries, Lithium-ion batteries, Vanadium Flow batteries, and others. Rapidly growing demand of renewable energy sources are the key factor driving the growth of battery energy storage system market worldwide. The several government organizations across various countries are taking the initiative to promote the use of renewable energy. The energy storage system play an important role in the renewable energy generation system as they helps to improve the reliability and flexibility of the system. The increasing adoption of lithium ions battery in the renewable power generation system is likely to escalate the demands of battery energy storage system market. Furthermore, the decreased pricing of lithium batteries is also one of the factors that helps to boost the growth of battery energy storage system market. However, the high initial investments are hampering the growth of battery energy storage system market. 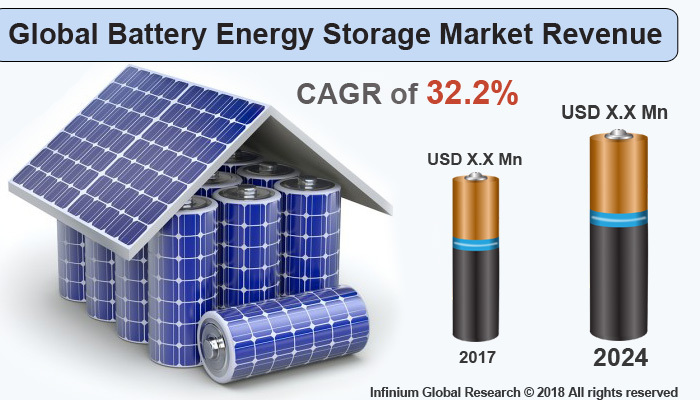 Moreover, ongoing developments in the renewable energy sector, and the use of battery storage for residential application are projected to create several opportunities in the battery energy storage system market. Geographically, North America holds the maximum share in the battery energy storage system market and expected to be the dominating region in this market over the forecast period. The rapidly increasing demand for battery required to store renewable energy and increase number of data centers powered through solar energy in North America are driving the growth of battery energy storage system market in this region. Furthermore, Asia Pacific is the fastest growing region in the battery energy storage system market owing to the growing adoption of renewable energy, favorable government policies and rapidly growing energy sector. The report on global battery energy storage system covers segments such as, technology, connection type and application. On the basis of technology, the global battery energy storage system is categorized into lithium-ion batteries, sodium–sulfur batteries, lead-acid batteries, flow batteries and others. On the basis of connection type, the global battery energy storage system is categorized into on-grid connection and off-grid connection. On the basis of application, the global battery energy storage system is categorized into residential, non-residential and utilities. The report provides profiles of the companies in the global battery energy storage system such as, ABB, LG Chem, Panasonic, Samsung SDI, General Electri, Hitachi, Siemens AG, Tesla, NEC and AEG Power Solutions. The report provides deep insights on demand forecasts, market trends and micro and macro indicators. In addition, this report provides insights on the factors that are driving and restraining the global battery energy storage system. Moreover, IGR-Growth Matrix analysis given in the report brings an insight on the investment areas that existing or new market players can consider. The report provides insights into the market using analytical tools such as Porter's five forces analysis and DRO analysis of battery energy storage system. Moreover, the study highlights current market trends and provides forecast from 2018-2024. We also have highlighted future trends in the battery energy storage system that will impact the demand during the forecast period. Moreover, the competitive analysis given in each regional market brings an insight on the market share of the leading players. This report will help manufacturers, suppliers and distributors of the battery energy storage system to understand the present and future trends in this market and formulate their strategies accordingly.